Patrick Harestad is a Certified Anusara Yoga instructor, Board Advanced Certified Structural Integrator, (Kinesis Myofascial Integration) and a Certified Massage Therapist. He has been teaching Hatha Yoga since 2000, and Anusara Yoga since 2002. His love affair with yoga began at age 16 as a student of Swami Satchidananda, when he spent two years studying and practicing Integral Yoga. Since then, he has studied many forms of body/mind/spirit disciplines, including nine years of Aikido practice, (he holds a black belt), five years of Jui Jiutsu and decades of surfing. Since 1997, he has had a regular practice, which has included meditation, Ashtanga Yoga and Anusara Yoga styles. He has studied extensively with John Friend, creator of Anusara Yoga, since 2002, including Workshops, Teacher Training, Yoga Therapy trainings, retreats, and a Master Immersion (over 600 hours with John). He has taught Yoga and Martial Arts both in the U.S. and in Brazil, where he spent two years living in a Buddhist retreat center with His Eminence Chagdud Tulku Rinpoche. 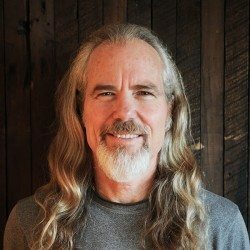 Patrick’s teaching blends his deep exploration of Anatomy, Kinesiology, and Structural Integration modalities with Anusara Yoga to bring a unique experience of hatha yoga. He is currently teaching three Anusara Yoga classes a week and is dedicated to his Myofascial Release, Yoga Therapy, and Massage practice in Arcata.